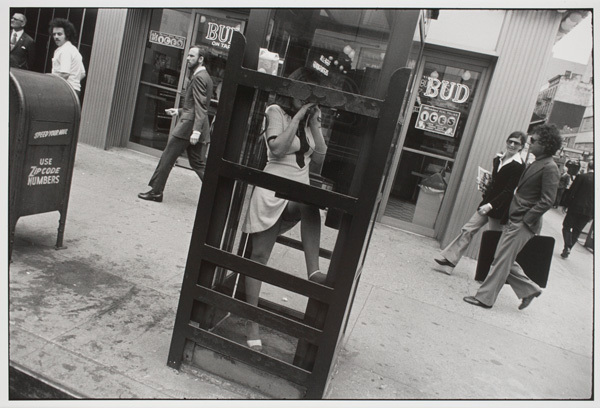 Winogrand snaps an off-kilter photograph of a faceless, smiling woman in a telephone booth. Central to the photograph is the provocative fork between her thighs, the result of a propped up foot. Winogrand’s innovative use of a cockeyed camera effectively makes the booth appear to tilt while the woman remains mostly aligned. By distorting the perspective this way, Winogrand draws attention to the opening of the woman’s legs. Associate Professor of Philosophy, Simon Feldman, who teaches Ethics and Feminist Philosophy at Connecticut College, describes the caller as “an anonymous, caged go-go dancer rather than a specific individual”. Interestingly, only two people look in the direction of the viewer. On the left a man in a white shirt appears to be turning around, perhaps toward the woman or Winogrand. On the right, a woman dressed in a casual suit, similar to that of the man beside her, carries Cosmopolitan wearing sunglasses. Her gaze toward the booth coupled with the turned head of the man in white, imply a “V” shape, again emphasizing the woman’s split-open legs, but also underscoring the position of the viewer through Winogrand.